May was Mediterranean food month and the Mediterranean Foods Alliance website had a recipe contest and has posted the winners on their website. 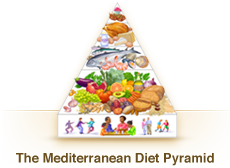 We have mentioned this website before because it is one of the best sites if not the best site for learning about the Mediterranean diet. They have an educational introduction for the beginner, extensive resources for the experienced, lots of wonderful recipes, practical tips for introducing the Mediterranean diet into your diet and much more. This is all presented in a beautifully designed website, well worth the visit. This entry was posted in Food and Recipes, Health by admin. Bookmark the permalink.